A view of the future Dolores Park from the 18th and Dolores entrance. Although the fog has been rolling in of late, we’re still spending our days dreaming of a sun-soaked return to our beloved Dolores Park. Of course, at the moment, the park has a huge hole in the middle of it, thanks to construction crews moving forward with a huge overhaul of the much-loved hangout spot. Want to know what's in store? 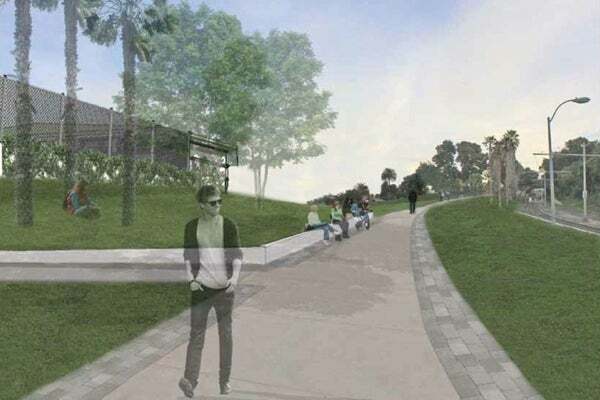 Thankfully, we now have something of an idea thanks to an Art Commission hearing last week in which architects for Royston Hanamoto Alley & Abbey were given the official thumbs up to redesign the park’s landscape. Curbed SF reports that the team plans to add large restrooms on both sides of the park, seating space (with a nice vantage point) on the northeast corner, a relocation of the center bell, and much, much more. Peep the future of Dolores Park here and here.